If they rock a mustache, goatee, or clean shave, this classy chrome set with up their grooming routine. A well-cared-for beard makes the world go 'round—at least for us beard lovers. Keep a strong groom game with this unique shaving set. 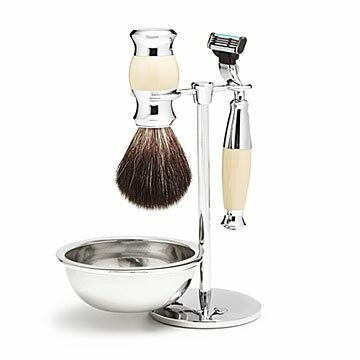 Its got class: a bright chrome stand, soap bowl, three-head razor, and vegan brush that lathers like "oooh, ahhh." It makes a great gift for men with facial hair of all kinds (mustache, goatee, lumberjack) or those who take their groom game seriously. Made in the United Kingdom. Mach3 Razor: Rinse in warm soapy water and dry after use - do not use any harsh cleaning materials. If necessary chrome cleaner can be used with a soft, dry cloth to polish.